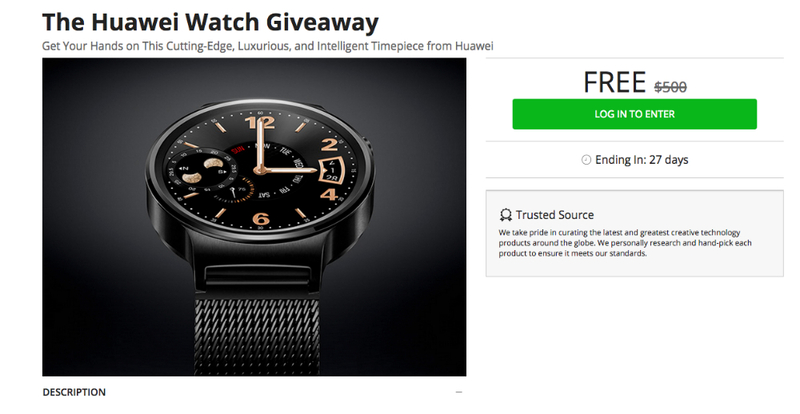 Through a giveaway currently taking place on the DL Deals Store, you have an opportunity to win the yet-to-be-released Huawei Watch. This smartwatch was shown off during this year’s MWC over in Barcelona, and from what we know so far, it’s a very luxurious looking timepiece. Entering these giveaways is very easy. All you need to do is head on over to our deals page, sign up (takes less than 1 minute), then enter the contest. To gain more entries, you will need to share the giveaway through your social channels (Facebook, Twitter), but that is only if you need more of a chance to win. This giveaway is scheduled to close in 27 days. As you should know, the Huawei Watch is not yet available, and as of right now, we don’t know exactly when it will hit the market, or for how much. With that said, as soon the watch begins shipping to markets, you shall receive your prize.